Last Friday I checked the mailbox and found the newest issue of Interweave Crochet Accessories- yay! It is packed with over fifty projects–a lot of shawls, hats, and scarves, plus some home decor–just perfect for planning your holiday gifts. I have two patterns in it, as well. First up is the Jeanne Lois Bandit, a triangular shawlette that I like to wear ‘granny bandit’ style. (No, I didn’t design the yarn bomb in the photo! But yes, that confused a lot of people.) I wanted to create a triangular shawl that got wider faster than it got tall, in order to create a good length so I could wrap it around my neck without a huge triangle of fabric hanging in front. The stitch pattern is really easy to memorize, and there are little lace diamonds worked along the border to give it a little something. They’re tough to see in the photo and yarn selected, but here is a photo I took of the sample before I sent it off. This has more contrast so you can make out the design. I’ve made this one about four times now (here are two examples), and it’s a fun intro to lace for those of you who might be scared by the tiny yarn. Why? Because you’re pretty much only working into chain spaces (no long foundation chain), and you can make the shawl as large or small as you want, the pattern gives tips on how to do this. 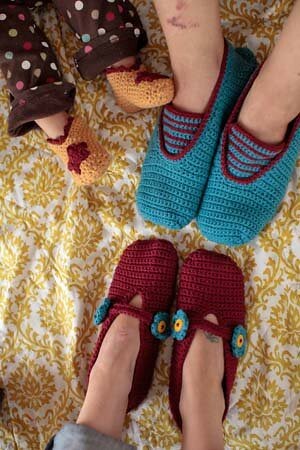 My second pattern in this issue is an any-size slipper pattern, called Mary Janes, Little Slippers and Loafers. For all its simplicity, I struggled with this one a bit because I really wanted to write a pattern that would work for any size foot. I get a lot of emails requesting more slipper patterns, so here’s my answer. 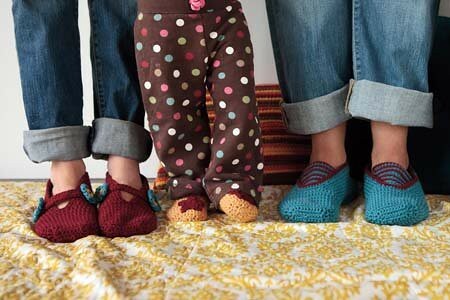 Each of the slippers is embellished in a different way, so I also contributed an article on ways to personalize yours. I got to showcase one of my favorite techniques–surface slip stitch (which was used to make the stripes on the blue slippers), and also talked about edgings, flowers, and stars. These work up quickly from worsted weight yarn, and if you don’t have the recipient’s foot handy, you can just ask them to have someone trace it (while they are standing up) and send the outline to you, then work from those measurements. Be sure to check out this issue when you have a chance–it should be on newsstands and in LYSes by now. Great new patterns, Linda! LOVE the "bandit" shawlette. 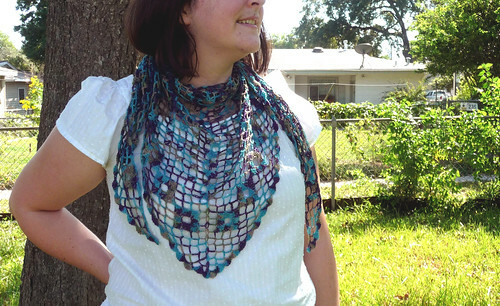 The triangle shawl looks like a great pattern for beginner lace workers. Nice job, as always!